4. Spend Some Time Exploring - Do you See Any Trees? List 4 common attributes for each point in a lidar point cloud. Briefly describe how a lidar system collects lidar points. Be able to describe the difference how a discrete and full waveform lidar system collect data. In the last lesson, you learned the basics of how a lidar system works. In this lesson, you will learn about lidar point clouds. 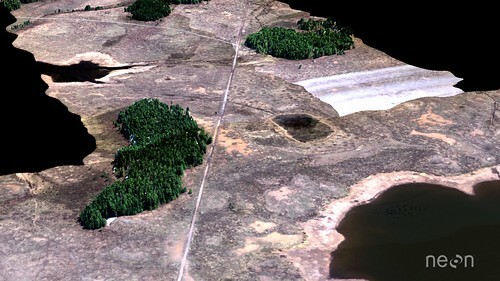 The point cloud is one of the commonly found lidar data products and it is the “native” format for discrete return lidar data. In this lesson you will explore some point cloud data using the plas.io viewer. 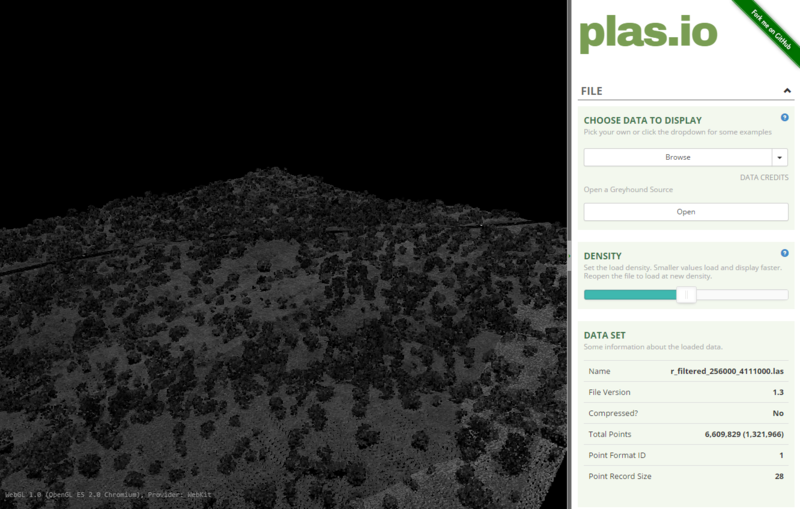 In this activity, you will open a .las file, in the plas.io free online lidar data viewer. 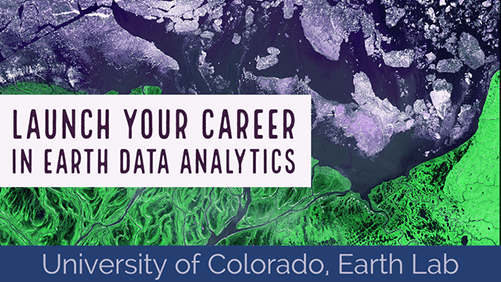 You will then explore some of the attributes associated with a lidar data point cloud. Remember that not all lidar data are created equally. Different lidar data may have different attributes. In this activity, you will look at data that contain both intensity values and a ground vs non ground classification. Plasio is a project by Uday Verma and Howard Butler that implements point cloud rendering capability in a browser. Specifically, it provides a functional implementation of the ASPRS LAS format, and it can consume LASzip-compressed data using the LASzip NaCl module. Plasio is Chrome-only at this time, but it is hoped that other contributors can step forward to bring it to other browsers. If you haven’t already, download the week 3 dataset - linked at the top of this page. It contains several .laz format point cloud datasets that you will use in this lesson. When the download is complete, drag one of the .laz files into the plas.io website. window. Use the particle size slider to adjust the size of each individual lidar point. NOTE: the particle size slider is located a little more than half way down the plas.io toolbar in the “Data” section. You can drag a .las or .laz dataset into the plas.io viewer to view the data in your browser! You might prefer to use a mouse to explore your data in plas.io. Let’s test the navigation out. Left click on the screen and drag the data on the screen. Notice that this tilts the data up and down. Use the scroll bar on your mouse to zoom in and out. How The Points are Colored - Why is everything grey when the data are loaded? Notice that the data, upon initial view, are colored in a black - white color scheme. These colors represent the data’s intensity values. 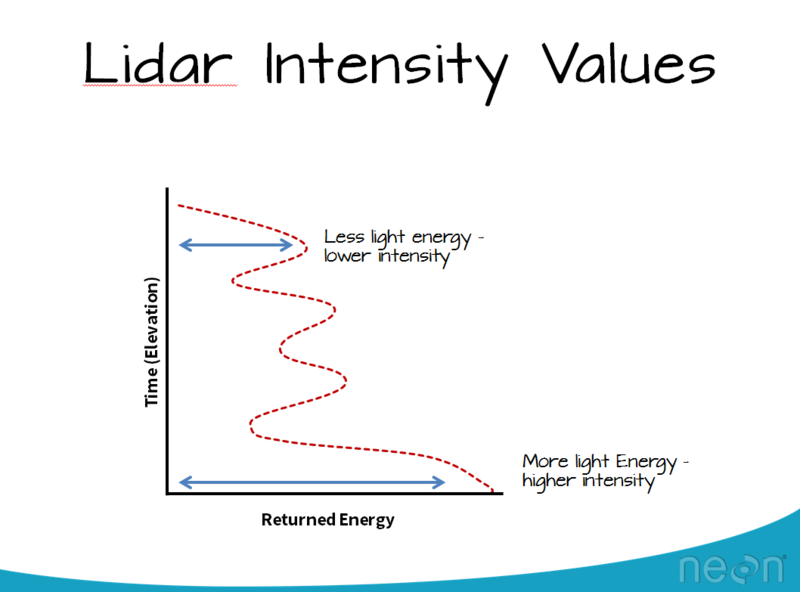 Remember that the intensity value, for each LiDAR point, represents the amount of light energy that reflected off of an object and returned to the sensor. In this case, darker colors represent LESS light energy returned. Lighter colors represent MORE light returned. Lidar intensity values represent the amount of light energy that reflected off of an object and returned to the sensor. Next, scroll down through the tools in plas.io. Look for the Intensity Scaling slider. The intensity scaling slider allows you to define the thresholds of light to dark intensity values displayed in the image (similar to stretching values in an image processing software or even in photoshop). Drag the slider back and forth. Notice that you can brighten up the data using the slider. The intensity scaling slider is located below the color map tool so it's easy to miss. 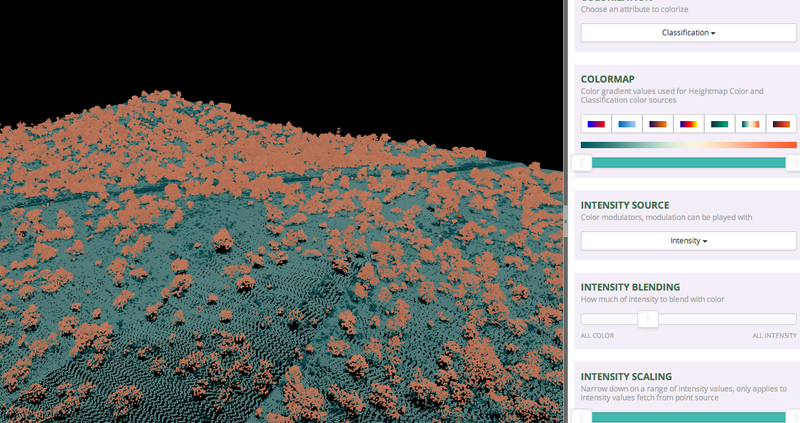 Drag the slider back and forth to adjust the range of intensity values and to brighten up the lidar point clouds. Blue and Orange gradient color scheme submitted by Kendra Sand. Which color scheme is your favorite? For kicks - play with the various colormap options to change the colors of the points. Set the colorization to 'classified' and then adjust the intensity blending to view the points, colored by ground and non-ground classification. Finally, spend some time exploring the data. what features do you see in this dataset? What does the topography look like? Is the site flat? Hilly? Mountainous? What do the lidar data tell you, just upon initial inspection? The plas.io online point cloud viewer allows you to quickly view and explore lidar data point clouds. Each lidar data point will have an associated set of attributes. You can check the metadata to determine which attributes the dataset contains. NEON data, provided above, contain both classification and intensity values. Classification values represent the type of object that the light energy reflected off of. Classification values are often ground vs non ground. Some lidar data files might have buildings, water bodies and other natural and man made elements classified. LiDAR data often has an intensity value associated with it. This represents the amount of light energy that reflected off an object and returned to the sensor. About the .las file format.